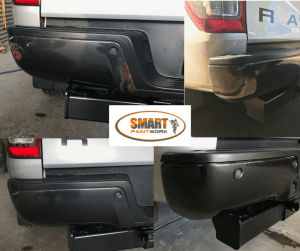 Using the SMART method to repair bumpers with our mobile service across Adelaide and surrounding suburbs, SMART Paintworx can perform small bumper repairs at the convenience of your home or office, saving you time and money. Small bumper repairs don’t have to mean losing your car for a week or two at a crash shop, and they don’t have to involve replacing the bumper or respraying a whole bumper to repair just a corner or small scrape. Scratches caused by placing and removing items into the boot, small dents, scrapes and scuffs from car park mishaps and holes from tow bars can all be repaired by our highly qualified technicians in a matter of hours. If the rest of the bumper is in good condition? If so, then there is no need to respray the whole bumper bar. Our motto is keep it small and keep the costs down. SMART repairs involve repairing any structural damage (cracks, splits, holes, dents) then respraying the paint work but only where the damage has occurred, blending outwards slightly into the surrounding area to achieve an undetectable repair. This way the damaged area goes back to looking as good as new in a matter of hours and at a cost that will be below your insurance excess, all while you’ve continued on with your day at home or workplace. 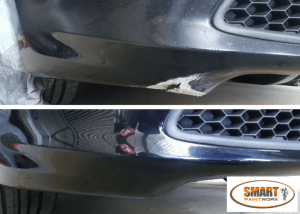 Over time metal bumpers can become rusted due to impact, the weather or other factors, but these sorts of repairs can also be undertaken by a SMART technician. In the photos below you can see how small areas of rust on a rear bumper have ruined the look of the car and made it look much older than it is. Within a short time the rust was repaired, the paintwork resprayed to the original colour and the vehicle has a new lease on life! 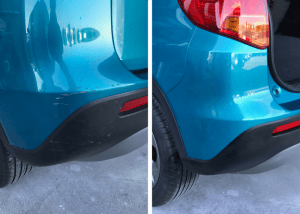 It’s not just plastic and metal bumpers that can be repaired the SMART way; textured bumper bars and bumper trims can also be repaired using our methods. While returning textured bumpers to the original factory finish isn’t always possible, you usually won’t be able to tell by looking at it once the repair has been completed. Damage small or large can ruin the look of your vehicle, but small bumper repairs don’t have to break the bank or mean losing your vehicle when you need to use it daily, just think SMART! This entry was posted in small bumper repairs and tagged bumper repairs adelaide, mobile bumper repair, small bumper repairs. Bookmark the permalink.